BMW F90 M5 with S63B44T4 engine was presented on 21st August 2017 at the Gamescom. The car is becoming available for clients from early 2018 year. The BMW F90 M5 is available with all-wheel drive. The powerful engine of 441 kW gives the driver the feel of power but at the same time the comfort for a short and long distance trip. The power is similar to BMW limited editions like “Competition Package” or “30 Jahre M5” but, the torque is raised to 750N m, which is 90 Nm more than the previous M5 series. 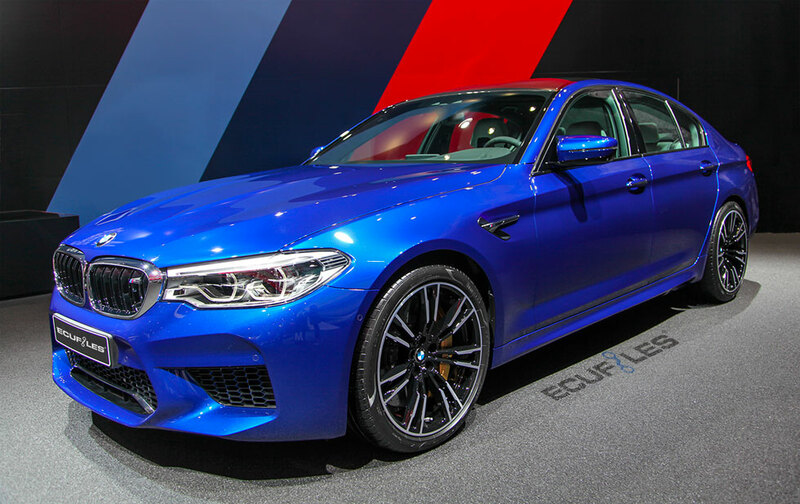 This car has an automatic transmission, and due to a torque converter, BMW F90 M5 launch is different then compared to the previous generation. BMW F90 M5 gets to 100 km/h in 3.4 seconds and reaches 200 km/h in 11.1 seconds. BMW put limits of the speed for this car to 250 km/h. At ecufiles.com we get rid of the speed limit for BMW M5 and we do it already in stage 1 tuning! Ecufiles provides a really powerful Mg1 tuning file together with stage 1, stage 2, catalyst off, pop and bang. Pop and Bang become extremely popular for the BMW F90 M5 series. With our tuning files for BMW M5, the exhaust will sound more sporty and pop and bang will be louder. BMW F90 M5 Tuning Files are powerful and ready to download, you simply need to register on our website, upload client’s file and wait a bit for the perfectly tuned file. Help your clients increase power & torque with safe and perfect match ECU tuning files. Click below to register to our system and get professionally tuned files today! on stage 1, stage 2, catalyst off, pop and bang.